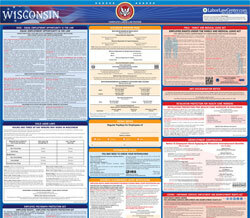 The Hours and Days of Work Minors May Work in Wisconsin is a child labor law poster by the Wisconsin Department Of Workforce Development. This poster is mandatory for some employers, including employers of minors. This poster must be posted in a conspicuous place by all employers that employ minors so that all minor employees can see it. This poster describes the restrictions on the hours of minors for Non-School Weeks and School Weeks as well as Non-School Days and School days. This poster also describes what minors need to acquire before they can work as well as the minimum they can be paid. It appears you don't have a PDF plugin for this browser. Please see the link below to download wisconsin-erd-9212-p.pdf. or permitted to work during hours of required school attendance under Wis . Stat. § 118.15.
agriculture. In most other types of labor, minors  under 16 may only work six days a week. Wisconsin Employment of Minors Guide (ERD -4758 -P). Employers  subject to both federal and state law s must comply with the more stringent section of the two laws. experience and career exploration programs operated by the school. more than one employer during the same day or week. the same hourly and time of day restrictions as minors who are 14 or 15 years of  age. Minors under 18  years of age may not work more than 6 consecutive hours without having a 30- minute, duty free meal period. start of the next shift . of employment . On the 91	st day, the wage must increase to $7.25 per hour. Hour, 740 Regent St reet, Suite 102, Madison, WI   53715.